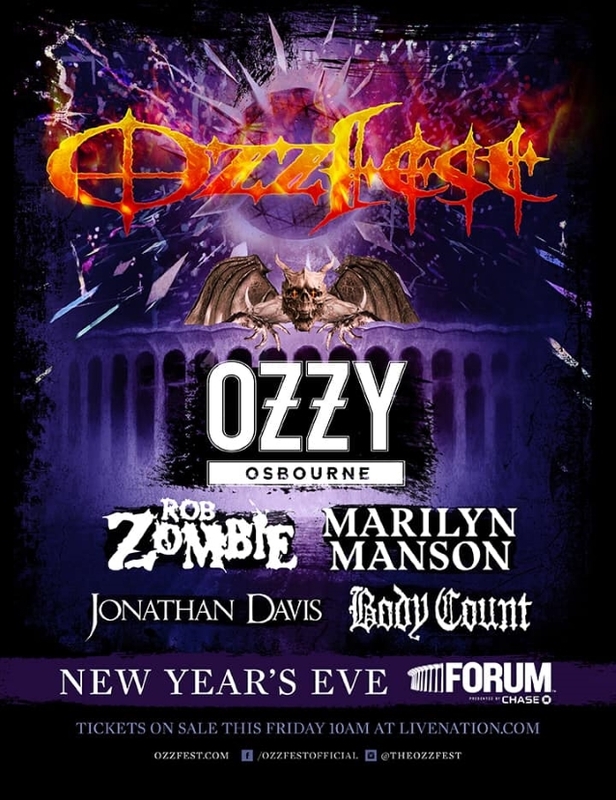 OZZY, ROB ZOMBIE And More Set For New Year's Eve OZZFEST! OZZY OSBOURNE will headline a one-off Ozzfest concert on December 31 at the Forum in Los Angeles, California. Joining him on the bill will be ROB ZOMBIE, MARILYN MANSON, KORN's Jonathan Davis (playing a solo set) and BODY COUNT. BLACK LABEL SOCIETY, fronted by Osbourne's guitarist Zakk Wylde, will headline a second stage outside. Four other yet-to-be-announced bands will also play that stage. "Ozzy hates the holidays," Sharon Osbourne, Ozzy's wife and manager, tells Rolling Stonewith a laugh. "He hates Christmas and he hates New Year's Eve. He always saying, 'Let's do a gig.' And I'm always like, 'There never is one.' So this year, we said, 'All right, let's do an Ozzfest, because we never did it this year.' Everybody used to play on New Year's and Christmas in the seventies and Eighties, but not anymore. So it's the perfect time." Tickets for the event go on sale this Friday, October 26 at 10 a.m. PT via Live Nation. In addition to the performances, the Ozzfest will also feature other "holiday festivities," which are yet to be announced. Ozzfest started more than 20 years ago and was the first national music festival of its kind dedicated to hard rock music. Ozzfest has not been a traveling festival in the U.S. since 2007's "free" edition. The show morphed into a one-off event in Dallas in 2008, took 2009 off and played just six cities in 2010. Over 17,000 concert-goers were in attendance for last year's all-day Ozzfest, which was headlined by OZZY OSBOURNE, while ROB ZOMBIE closed out the next day's Knotfest bill. 2017 was the second year Ozzy's Ozzfest had merged with SLIPKNOT's Knotfest for a two-day heavy metal juggernaut.